For all supported data types, support covers parsing, indexing and searching of retrieved full-text and metadata. For many supported data types, display also includes integrated image display along with highlighted hits. Supported data types. dtSearch’s proprietary document filters support parsing, indexing, searching and display with highlighted hits of text and metadata across a broad range of data types. Emails and attachments: supports integrated browser-ready images, text and attachments in Outlook/Exchange (PST/OST/MSG) and Thunderbird (MBOX/EML); support includes emails saved from Office 365. Recursively embedded objects: supports recursively embedded objects and images in supported email types and MS Office formats. For example, the dtSearch document filters would support an email attachment consisting of a ZIP container including both a PDF and an Access database, where the latter also includes an embedded PowerPoint with embedded images. Full list of supported document types. Federated searching and the dtSearch Spider. 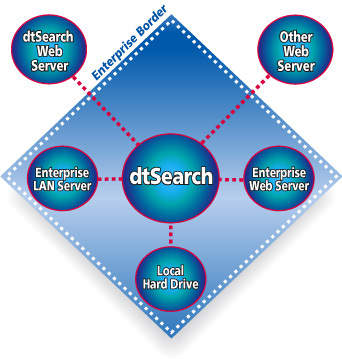 dtSearch products provide federated search across any number of directories, emails (with nested attachments), and databases. The dtSearch Spider adds local and remote online content to a search. The Spider can index sites to any level of depth, with support for public and secure online content, including log-ins and forms-based authentication. dtSearch products provide integrated relevancy ranking with highlighted hits across both online and offline data. Note: for developers, the Spider is presented as a .NET API. Document filter APIs. All developers APIs (C++, Java and .NET through current versions) make available to developers dtSearch’s text parsing, extraction, conversion and hit-highlighting capabilities. An “object extraction” API lets developers navigate through the structure of each embedded object as a hierarchy, and optionally extract each object, such as an image in an MS Word file embedded in an MS Access database, compressed and attached to an email. General dtSearch Engine licenses include the document filters along with dtSearch indexing and searching functionality. The document filters are also available for separate license for developers requiring text parsing, extraction and conversion “only,” without search.